So, you’re looking for a cheap motherboard to go with your budget build, which one should you get? We’re here to answer that question. Before we get into that, I want to go over a couple of things I’ve been thinking about lately. First of all, just because you go with a motherboard under $70 or even $60, that doesn’t mean you’ll get less in-game performance. A graphics card performs like a graphics card whether it’s on a $200 board or a $50 one. Second, few consumers actually overclock. Yes, there are some performance improvements that come with overclocking. However, most people simply don’t want to take a chance with their CPU or GPU or even bother with overclocking in general. Not to mention, if you’re focusing on overclocking in the $800 budget or below PC building space, you’re spending money that could be put towards better components at stock speeds. Lastly, just because you buy an expensive motherboard doesn’t mean it will last longer. I’ve had $300 motherboards arrive DOA just as often as the cheap ones and or even have them stop functioning after a short period of time. Yes, you could argue that those higher-end motherboards have better quality capacitors and other parts and it’d be true. On average, they’ll probably last longer and we certainly haven’t done the testing. However, when I look at Asus’ warranty for their cheapest motherboard and compare it to their highest end motherboard, they are the exact same, 3 years parts and labor. So, that should give you some indication of what I’m talking about here. Rant Done. On to the hardware. You don’t need to spend a fortune on your PC’s motherboard to enjoy the performance. Still, you want to get the most out of the price you pay. Here are a few options we like in 2018. What platform are you building with? AMD’s Ryzen platform is here to stay and gives some amazing value at each price point. No, the IPC is not on point with Intel’s Kaby Lake. However, it is on par with Intel’s Haswell-e processors. This means that the high core and thread count of these inexpensive processors make for an amazing workstation or editing build. For those that are curious about how Ryzen stacks up against Intel, we’ve done some benchmark comparisons. You can find benchmarks of the Ryzen 7 1700 vs the i7 here or the Ryzen R5 vs the Intel i5 here. 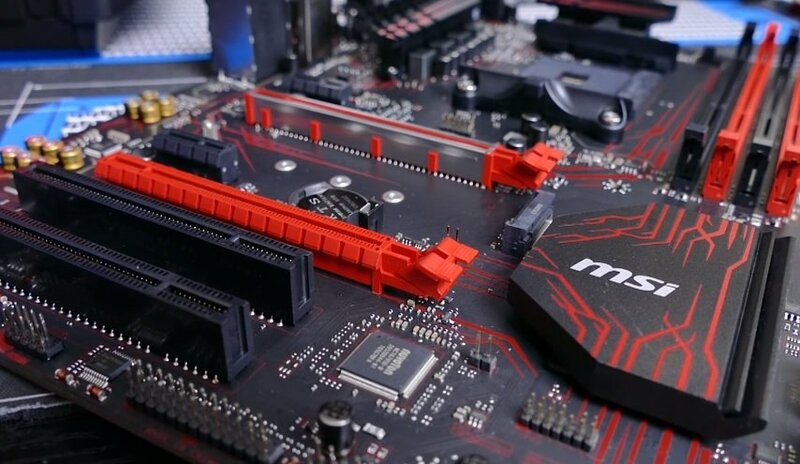 If you’re looking for a cheap B350 solution, we like the MSI B350M Gaming PRO. It gives you support for M.2, DDR4 at up to 2667MHz, and even overclocking for AMD’s new Ryzen processors. On MSI’s website, it states that this can go as high as 3200MHz and we can confirm at least 3000MHz. If you’re wondering what type of ram you should purchase, we recommend you take a look at our post on the best 3200MHz DDR4 memory for Ryzen processors. In addition, the AM4 platform comes with the latest support for PCIe 3.0, SATA III, and has great audio with the Realtek ALC887. It also looks great with the ambient red gaming LEDs and black and red color scheme. This is a good option to use in a $300 or $350 Ryzen 3 2200G build. One small setback for this board is that you’ll need your own graphics card for connecting your monitor. So, this board is ideal for those already planning on purchasing a GPU. To get this motherboard within the $70 range, you’ll need to look around. We regularly saw it for as high as $80 with sale prices at just under $70. Intel’s Coffee Lake processors offer exceptional performance. However, budget H and B chipsets still haven’t been released. So, we decided to feature one board here that broke our $50 to $70 budget rule. 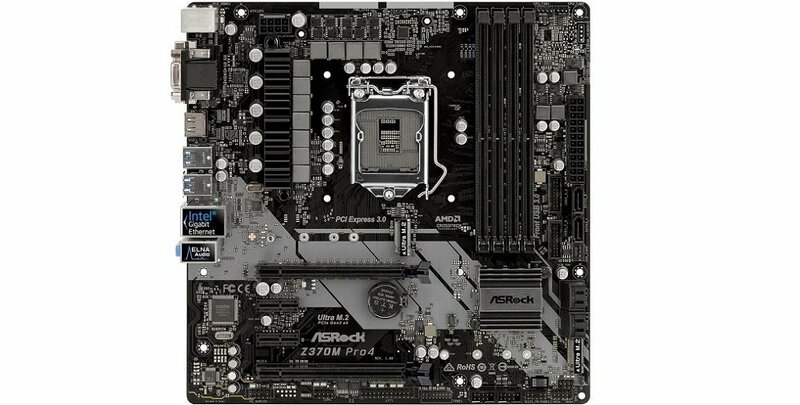 The ASRock Z370M Pro 4 is one of the more popular micro ATX options for Coffee Lake. It doesn’t have any fancy lights or an overgrown heatsink. Rather, what you get is a lot of performance in a small package. Working with the board is easy, even for a beginner, with a user-friendly BIOS and a rugged design. Specs for this board aren’t anything amazing, in fact, we doubt they’re much better than what you’ll get with a B series motherboard in the future; however, it does include the option to overclock if you want to get a CPU cooler and go that route. 10 Phase, Digi Power, Intel LAN, 2 M.2s, and support for up to DDR4 4300 dual channel memory are its key features. 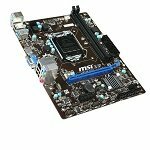 Overall this board is cheap for Z370, good quality, easy-to-use, and has most of the features people are looking for in a Micro-ATX system. It’s definitely worth a look if you’re looking to build soon with Coffee Lake. First of all, you might have to do a bit of price shopping, waiting, or rebate finding to get either of these two boards for the $70 price tag. However, I’ve been able to find them as low as $60, so I’m sure you’ll be able to do the same. The reason I like the B250 motherboards is they come Kaby Lake compatible right out of the gate with Ram speeds of up to 2400MHz. Compare that to Skylake’s non-Z170 chipsets and that’s a bit faster. What’s more is that you don’t have to worry about compatibility with the intel 7 series processors. Cheap chipsets like the H110 are compatible with Kaby Lake processors; however, they may require a BIOS update. If you don’t have a Skylake chip, then that can be kind of hard. So, you want Kaby Lake compatibility, an M.2 slot, PCIe 3.0 x16, Gaming LEDs, Mystic Light Sync, and DDR4 memory but don’t want to pay a ton of money. Totally fine! If you’re wanting to go with a 7th generation processor, I highly suggest the MSI Gaming B250M bazooka. It’s cheap, reliable, has a decent BIOS, and even looks good. If you’d prefer a standard ATX motherboard, you can get the MSI B250 PC Mate for around $5 to $10 more. For ITX, the B250I Pro is around the same price. 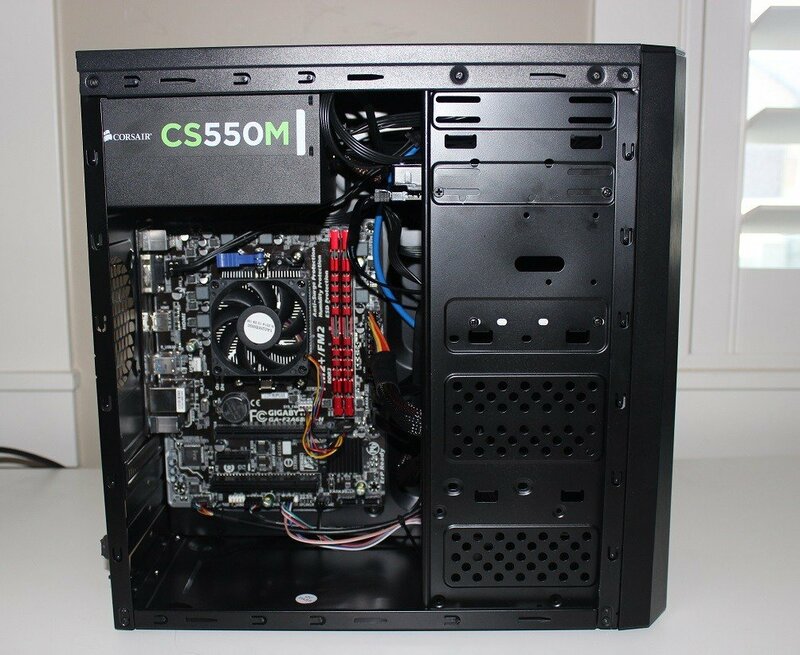 It’s a great option for a budget processor like the Pentium G4560. For those of you wanting to use higher speed memory, the Bazooka can use memory speeds as high as 2400MHz but won’t go beyond that. That’s fine because as we mentioned in our post on the best DDR4 memory for the money, 2400MHz seems to be a good sweet spot in terms of Intel’s performance. Lighting on the Bazooka is pretty cool with Mystic Light Sync, a solution for synchronizing all your RGB lights, and ambient LED lights. Specs for the Bazooka include the Realtek ALC887 chipset, 1 single M.2 slot, 6 x SATA 6Gb/s, 2 x PCIe 3.0 x 16 slot, 2 x PCIe 3.0 x 1 slots, and 1 x m.2 slot. Rear ports include 1 PS/2, DVI-D, HDMI, RJ45, 3 x USB 3.1 Gen1 Type-A, 1 x USB 3.1 Type-C, 2 x USB 2.0, and 3 audio ports. Looking for a Mini-ITX Build? Here’s a list of our top Intel Mini-ITX motherboards. Sixth generation Skylake is basically on par with Kaby Lake clock for clock. So, the difference between something like the i3-6100 and i3-7100 is very minimal. Yes, we mentioned the B250M Bazooka above and we like the same things about this board. That being said it’s $20 cheaper than the board above with most of the same features. Like the B250M you get support for M.2 and even a gaming LED Effect. The B150M does support DDR4 but only at 2133MHz speeds. So, if you go with this board, I recommend some budget DDR4 memory. It’s a bit different than the B250 in terms of its specifications, but still very similar with USB 3.0 ports and even a fantastic onboard audio in the Realtek ALC887. Both have MSI’s Military Class 4 classification which boasts quality components that should last you a long time. As I mentioned above, just because a board is inexpensive doesn’t mean it’s made cheaply. That’s certainly the case here. So, if you’re willing to go with a previous generation Kaby Lake processor, you can definitely save some money here and get basically the same performance. Yes, AM3+ is definitely still a thing. With an 8 core CPU like the FX 8320 in the $100 range, it’s finding appeal for those looking to build budget systems. Another reason is that it’s an alternative to Intel and with the Ryzen 3 still not released, consumers are trying to find value. Among the boards that are the most popular for this group, is the Asus M5A78L-M Plus. Unlike many other mATX motherboards in the $50 to $60 category, the Asus M5A78L-M Plus has support for up to 2000MHz DDR3. The board has a good audio chipset in the Realtek 8111H and support for USB 3.0. Other specifications include support for up to 32GB of memory, PCIe 2.0 x 16, and 6 x SATA 3Gb/s. Rear panel ports include a PS/2, D-Sub, DVI, HDMI, RJ45, 2 x USB 3.0, 4 x USB 2.0, and 3 audio ports. As long as you understand the limitations of this board you should be just fine. It doesn’t have modern features like SATA III support, PCIe 3.0, M.2 support, or DDR4 support. However, it’s a cheap motherboard for a budget system that has a lot going for it for the money you pay. There’s not a ton of reason to go with a Haswell system unless you use the Intel Pentium G3258 and want to overclock it. Otherwise, the more modern Pentium G4560 is the better performing CPU hands down. That being said, after Tom’s Hardware showed the G3258 at over 4GHz on the H81M-E33. For under $50 you get a whole lot with the H81M-E33. First of all, you get a solid performer that can support a massive overclock of the anniversary edition Pentium G3258. OC Genie 4 can be used to simply overclock the CPU. Second, you get support for DDR3 1600, PCI3 2.0 x 16, SATA 3, and even USB 3.0. It’s rugged, with military class 4 and gives you solid audio with the Realtek ALC887 chipset. The Rear panel includes a PS/2, D-Sub, HDMI, 2 x USB 3.0, 4 x USB 2.0, and 3 audio ports. Frankly, there’s less of a reason to order this up then there was a year ago. However, if you’re a power user, there’s still a lot to like about this inexpensive board. If you’re not, I’d stay clear. The next motherboard we’re mentioning was used on a cheap $150 build along with an FM2+ AM4 processor for AMD. The Gigabyte GA-f2A68HM along with an inexpensive FM2+ APU allows for low performance in 1080p for many of today’s hottest games along with solid 720p for even AAA titles. You could also use this as a good FM2+ APU motherboard combo for an HTPC rig to throw under your TV. I really like the flexibility of an HTPC and as such, built an energy efficient rig for myself a couple of years ago. The FM2+ platform is fairly modern, and definitely more so than the AM3+ platform. This includes support for up to 2400MHZ DDR3, PCIe 3.0 x 16, 4 x SATA 6Gb/s, and USB 3.0. Rear ports include a PS/2, D-Sub, HDMI, RJ45, 2 USB 3.0, 4 USB 2.0, and 3 audio jacks. If your aim is to play games like LOL, DOTA 2, Hearthstone, or even CS:GO this is definitely a viable solution. I installed an SSD in my PC and it remains snappy to this day. Whether you’re simply trying to play some F2P online games or want a media PC, check this one out. Paying a lot for your motherboard is something you definitely don’t have to do to get performance. That being said, I feel like it’s worth paying $10 to $20 more to get a motherboard in the $70 range that supports Skylake, Kaby Lake, or Ryzen. The additional DDR4 support, PCIe 3.0, modern USB 3.1 types, and M.2 give it further longevity.